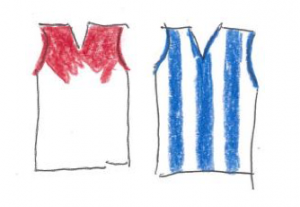 Round 7 – Sydney v North Melbourne: Just My Luck! It just happened to be a coincidence that on Saturday evening, my dad and I were at a friend’s house, only 10 minutes away from the CBD of Sydney. Of course, being the Swans fan that I am, I was hoping that my dad and I would be able to go to the Swans afterwards. My dad said that if we left by 6:00pm, there was a chance that we could go. I wasn’t upset at the fact that we were probably not going to be able to go, but it was the best-case scenario. Besides, I am a glass half-full person. It turned out that we ended up leaving at 6 on the dot, and I wasn’t sure whether my dad would say we could go or not. But when he pulled out his phone and opened up the Ticketek app I was stoked. We were going to the footy. Although it took twenty minutes, he eventually bought the tickets when we got to the ground, and walked through the gates. I was nervous about this game. I usually come into games feeling positive that we will win. However, after going to Round 5 and seeing us lose to an undermanned Crows outfit, I have changed my perspective. This is a danger game. North are 3-3 and they have beaten Hawthorn in that stretch. Of course, we are coming off a fantastic win down at Kardinia Park, but this season has no form line, so I am a bit unsure about how we stack up. North kick the first goal, but when Callum Sinclair got on the end of a spearing kick from Ronke (which is pronounced Ron-kee I think), and Towers kicked truly, we got a bit of a break on North. But the Kangas dominated the quarter, and when Hartung snapped accurately, they were back in front, with just over a minute left in the quarter. But then the replay came up on the screen, and I saw what the other 29,123 people saw; Macca got a finger to the ball. The cheers started to ring around the crowd, but when the ball was bounced in the centre, the red and white faithful gave a collective “Wtf??? ?” Isn’t it a little weird that the umpires decided to: a) Ignore McVeigh, and b) Decide that time had run out, like that was some sort of rule? Come on, guys!! Anyway, the second quarter began, and after Ben Brown slotted his only major for the night, the Swans began to assert themselves through Isaac Heeney, who brilliantly placed an inch-perfect kick to the advantage of Hayward, running into the goalsquare. He got out the back, and the crowd roared as one for the birthday boy! Fox kicked another, but the Kangas soon steadied up until half time. After the break, Wood stretched the Kangas out to a sixteen point advantage, until Hayward sprung to life. After leaping off the back of one of the Kanga’s defenders, He converted, to give us some more hope. Parker then turned around, and off one step, bombed a monster goal through the sticks. I was yelling so much, and I started losing my voice. Little did I know what my vocal chords were in for. Both teams were extremely inaccurate on either side of three quarter time. So many balls were kicked out on the full by both teams, and I lost count. “We’re missing Buddy today” says my dad. He’s onto something. It was such a low-skill contest; a situation in which Buddy thrives. Anyway, Hayward started the quarter the same way that he ended the third, kicking his third goal. The crowd begin to roar. “Sydneyyyyy, Sydneyyyyy” begins to roll around the ground. We can taste kangaroo blood. Jones’ fantastic set shot gives us the lead for the first time since the opening term. My voice cracks into anguish, but I don’t really care. I am jumping up and down. So is my dad. Mason Wood gets one back for the Roos, but when Jake Lloyd converts, I yell the loudest I can. I love these games!!!! Enter Mason Wood. Like a bull on steroids, he pushes past three of our high-quality defenders. I bury my head into my hands, because I know what is coming. The crowd goes silent. They have hit the front. We realise that there cannot be much time left. However, it is a longer quarter, so we have more time than we think. When Papley marks a fantastic kick from Nick Smith, I yell extremely loud. Here he is, with the chance to kick the matchwinner. And shock, horror, he sprays it across the face. Rampe then fumbles, and the pressure from North is enough for him to spray it left. Disappointment all around. The siren sounds, and I am pretty gutted. I lost my voice for this game, and I was so confident we were going to win. It has leapfrogged that Sydney vs Essendon game in 2015, being the closest game I have ever been to. The Roos held on. We have lost three games at the SCG now, and while it was disappointing on the one hand, it was great to see a game come down to the wire like that. Bring on the Hawks! Nice write up Daniel. I secretly suspect your dad timed it so you could go to the footy! Shame about the result; left our run too late and had the kicking yips all night.